Part of the country has dealt with record breaking high temperatures other parts have been plagued with flooding. For those of you who have experienced high water here are some tips if your HVAC system was under water. Mind you this is for minor and temporary water coverage of your equipment. 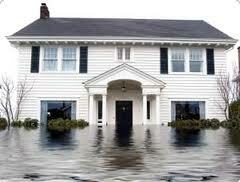 If you have experienced major flood damage and loss notify your insurance company and call in the professionals. Do not attempt to work on or around damaged high voltage electrical or gas lines yourself. · Make sure all power is off to the unit. Turn off at the breaker box, disconnect box, and turn gas off at the gas stop. · Do not attempt to turn on unit until system is completely dried out. · Wear gloves when working and cleaning around unit. · Remove old air filter and replace with new filter after unit has been cleaned. · Remove any foreign debris that may have accumulated around or inside of unit. · Removed all panels and clean with diluted bleach mixture (1 cup bleach to 1 gallon water). Clean inside and outside of unit, every inch that you can get to with a small sponge. Do not mix cleaning solutions. · Inspect all wiring and components for damage. · Oil motors that have oil ports. · Turn power back on. Check the air conditioning first, then the heat. It might be a good idea to have two people available, one at the breakers and one at the unit with a fire extinguisher at the ready. · A mild musty odor is normal. You can buy scented air freshener packs at Lowes and Home Depot that attach to your air filter. · Visually inspect visible parts of ductwork and insulation for mold. · This might be a good time to consider air duct cleaning. For more information go to www.cdc.gov and search “Flood Contaminated HVAC Systems”. I am often asked about the different Home Warranty Companies and my opinion of them. I have found many of them care very little for the customer and care only for the bottom line. Which is the what and why they are in business. I have dealt with many different Home Warranty Companies over the years. I know of many HVAC contractors who refuse to do business with HW. They are known for poor service response to the customer and beating up the contractors over price and slow to pay. After sitting on hold for what seems like eternity. The very first questions when calling for repair approval are questions designed to get a response to give reason to decline the claim. So by the time you are done with the service call everyone is mad, customer, technician, bookkeeper and manager. I have found one company in the 23 years that I have been in HVAC industry that I feel I can recommend. They seem genuinely concerned for the customers well being. Their customer service representatives seem more polite. I mentioned this fact to one of the trainers at a class I attended. He told me they had worked very hard on training that stressed communication skills based on superior service and that claims authorizers were allowed and encouraged to use think outside the box problem solving methods to get claims taken care of. Those were not just words, I have personally worked with them locating parts and units and fixing real problems for people. I felt like there was much more respect paid to customers and contractors that any other Home Warranty Company I have ever worked with before. I have seen them authorize overtime service calls due to extreme heat or because some had an illness. I have seen them replace a unit rather than replace motors because they thought it was more cost effective. They require and pay for a leak search if more than two pounds of refrigerant need to be added to a system. Their phones are answered 24 hours per day. They follow up with customers and contractors to make sure all work is done and parts are ordered better than anyone I have ever seen. I am sure they are not perfect, but I rate this company way above average! I can honestly say that Cross Country Home Services is the best home warranty service company I have ever come across. I whole heartily indorse them. For more information you can call them at the number below or go to their web site. Their home office is in Ft. Lauderdale, FL., they service all 50 states. I want to write about something that has nothing and yet everything to do with air conditioning. I don’t care what business you think you are in or where you work or what you think you do for a living. You are in the people business. Somehow whatever you do to make a living impacts people. Either through products and their quality, customer service, or quality of life, somehow it touches people’s lives. It seems to me that this fact is being forgotten more and more in the me, me, me society we tend to live in. Once I adopted the Zig Ziglar philosophy, “You can have everything you want out of life, if you will just help enough other people get what they want.”; my life took a dramatic change for the better. I felt better about what I was doing and what I was charging for. I truly developed a servant’s heart. My bank account increased, my self esteem improved, my referral business quadrupled and I felt a true sense of fulfillment I had never experienced before. I do this through the air conditioning business. I will truly go to the ends of the Earth for a customer to find solutions to their HVAC problems. I will come in early, work late, skip lunch, drive across town in the rain to get parts, call every supply house in town, call in favors, but most importantly I will admit it when I screw up and tell the truth about it, face the consequences and do whatever I can to fix it. How many companies today can say that last statement and mean it? Three years ago another company came to her old house and told her she had a bad compressor. She then had me out to do a free second opinion, I agreed. She hired me to change out her compressor. I went to parts house picked up the compressor, blocked out five hours of my schedule, hauled all my tools to the backyard, set up my recovery tanks. To make a story that is starting to get long, shorter. I realized that down underneath the unit was a wire disconnected that I had not been able to see until I had everything all torn apart. I think you know what happened. I reconnected that wire, went and turned the power back on to the unit. Guess what? Compressor started up! Did I feel like a fool? You bet. I told the customer the truth. I made a customer for life. She has sent me more business than you can possibly imagine. I could have changed out that compressor. I am sure she already had the check made out. I gained so much more the other way. I felt better, she loves me, tells everyone she loves me. I got more customers from losing that compressor sale than I would have ever gained from a dishonest act not to mention my own self respect. I write this not to talk about myself but to show an example of how when you live by principals and stand for something greater than yourself you will be repaid multiple times. What are your principals? What do you stand for? Last night I went to bed feeling pretty darn good about myself. I wish every air conditioning technician in the world could say that. Wouldn’t the world be a much better place to live? Trying To Save The World One Air Conditioner At A Time! P.S. I am very lucky to work for a company whose motto is: If you always do what is truly in YOUR customer’s best interest, you will never be wrong.